There are advantages to any pressure washer, but there are specific advantages to using a gasoline powered pressure washer. But first, why use a pressure washer at all? There are many things around the house that can be washed with water alone if it is put under enough pressure. Sometimes using a pressure washer can actually conserve water, putting water under pressure and forcing it through a smaller opening actually reduces the amount of water flowing through the opening. Both gasoline and electric pressure washer need routine maintenance to function properly and any worn parts of the pressure washer should be replaced immediately. The pressure of a garden hose is not great enough to clean anything, it just spreads the dirt around; this is when a pressure washer can come in handy. Basically a pressure washer consists of a pump and a motor. The nozzle of a garden hose increases the water pressure about four times from 10 psi to about 40 psi; a residential pressure washer can produce pressures of up to 5,000 PSI. There are many advantages to owning either a gasoline or an electric pressure washer; you just have to decide which is best for you. The following are some benefits of a gasoline powered pressure washer over and electric powered unit. Gas powered units can deliver a lot more PSI than electric units. A typical electric unit will deliver about 2,000 psi; this is where gasoline powered pressure washers begin, from there they go up to 5,000 psi. Because they have a higher PSI gasoline powered units are better for cleaning large surfaces like houses, driveways or decks. 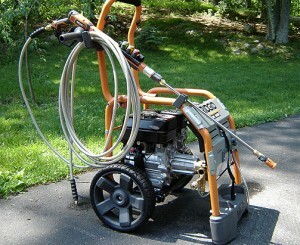 Electric powered pressure washers are more suited for cleaning smaller item like automobiles or boats. Since gasoline powered pressure washers do not need to be connected to a power source they are more mobile than an electric pressure washer. It is perfect for outdoor use, no extension cords are needed to reach an electrical outlet; and better yet, there is no cord to maneuver around or trip over. Having a pressure washer at home can make home cleaning chores quicker and easier; but it is important to assess what the primary use of the pressure washer will be and decide which type of unit will be best for you. PreviousWhat Sets a Settee Apart?